One of the most popular compact hybrids available on the market today is the Toyota Prius, one of the pioneers of gas/electric hybrid automobiles. It constantly keeps improving by adding new technology features every so often. Among its many unique and impressive features, one of the most innovative is its enhanced parking support. It consists of an Intelligent Clearance Sonar that detects moving and stationary obstacles and alerts you to help avoid a collision. Another thing that makes it so advanced is that it offers a smart key system that lets you touch the door with the key to unlock it, while the ignition is just a button. 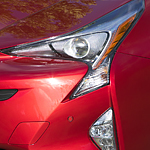 Are you interested in sampling the technology features of the Toyota Prius? Be sure to get in touch with a member of the team at Charlie's Toyota in Augusta today so you can set up a time to see it for yourself.